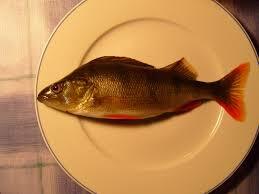 If you try your best to eat healthy, then chances are that you try to eat fish at least twice per week. However, when you read about the contamination of our oceans and fresh water fish, it’s hard to know which fish would be the best choice. Turn your printer on because you will want to print out this list and keep it in your purse or pocket. We are going to nail down the 5 least contaminated fish you should choose for your weekly meals and 5 of the worst offenders that should never grace your plate. Ready? Keep reading so you can feel good about your Sunday fish fry! Although many types of tuna are high in mercury, tuna from the U.S. or Canadian waters (which is the most common kind of white albacore tuna you find in cans) is still safe to eat. The trick here is to make sure that it says “poll or troll caught”. This is because pole-caught tuna generally weighs no more than 20 pounds. Younger fish have lower contaminant ratings. One quick way to tell is to look for the MSC (Marine Stewardship Council) blue colored eco-label. Wild Alaskan salmon are well managed and have strict quotas on how many can be caught. Biologists also monitor the water quality, which means these fish are not only super tasty, but super healthy fish that are high in those omega-3s everyone wants. Unfortunately, wild caught lake trout are super high in contaminates. This is why almost all the rainbow trout sold in the U.S. are farmed in freshwater ponds. You might think farmed fish is a bad thing, and it sometimes is, but not these little beauties. If you aren’t a fan of the “fishy” taste of ocean fish, try rainbow trout! Tiny and inexpensive, sardines are one of the best sources of calcium. Omega 3s, and one of the very rare foods that have vitamin D. You will find that many herrings are called sardines. These tiny fish are quick to reproduce and appear to have avoided contamination from the Fukushima disaster. You should read labels carefully before you buy this kind of salmon. Be sure that it is Coho salmon that is farmed in the U.S.A. While many farms in other countries are overcrowded and, therefore, need to use antibiotics, not to mention most are contaminated with parasites, American farmed Coho salmon are raised in roomy, freshwater pens that are sealed off. This means they can’t pick up germs and parasites from wild fish. Its real name is the Patagonian Toothfish, but those smooth marketers found out that people would eat it if you called it Chilean Sea Bass. These fish have been nearly fished into extinction and the methods used to catch them not only ruin the sea floor, but they tend to catch seabirds as well. Leave these fish alone until they can repopulate or until they can be successfully farmed. First, Bluefin tuna is so high in mercury and PCBs that most environmental groups won’t recommend eating this fish even once per month. Second, this type of tuna has been so overfished that the World Wildlife Fund wants it put on the endangered species list. A long -time favorite, Orange Roughy is slow to reproduce, which has left it very vulnerable to overfishing. With life spans of about 100 years, these fish have tons of time to pick up every contaminant in the ocean several times over. These fish have high levels of mercury and, therefore, are not recommended for eating in any amount at this time. 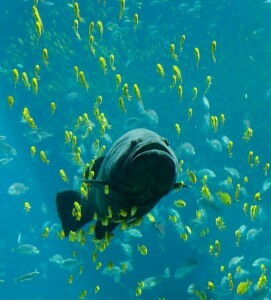 Like Orange Roughy, groupers have high levels of mercury that make them unsafe for human consumption at this time. They are very slow to reproduce, also, which has made them vulnerable to overfishing. Make another choice if you are offered grouper. Unfortunately, these fish, which are commonly found around piers, have very high levels of mercury. 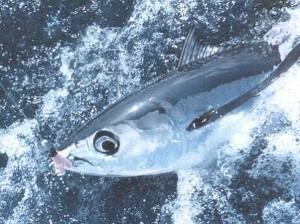 King Mackerels like to migrate and is often found right off the coast of Florida, the Carolinas, and Georgia.